Protests took place around the country on the 14th April as part of the Third National Day of Action Against Benefit Cuts. 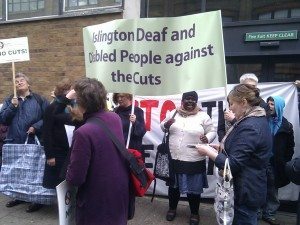 An early morning demonstration in Islington saw a crowd gather outside the North London Atos testing centre, and demonstrations also took place outside Atos in Bristol as well as in Burnley, Poole and Truro town centres. A demonstration of roughly 40-60 people gathered outside the Daily Mail head office in Kensington demanding that they end the lies they print about disabled people and benefit claimants. Police initially prevented the protest happening outside the Mail’s entrance and demonstrators gathered opposite the front door of the Daily Mail Group on the other side of the building instead. As the protest became increasingly angry it managed to move to it’s intended location where the microphone was passed round and impassioned and diverse expressions of contempt were aimed at the so called newspaper. Protesters then moved onto to Westminster City Hall where over a hundred people shared food, made speeches and vowed to defy any attempts to criminalise rough sleeping and the handing out of food in parts of the borough. The Daily Mail’s Scotland offices were also targeted with activists invading their offices to distribute information and tell the faceless hacks personally what they think of the Daily Mail’s abuse of disabled people. Prior to this the group has demonstrated outside the Glasgow offices of Atos Origin, the company responsible for health testing benefit claimants in an attempt to strip people of benefits. Atos Origin were the focus of many protests around the country. Their testing centre Edinburgh was picketed whilst over 40 people protested outside their premises in Dundee. The protest at Atos’ Scotland Head Office in Livingston turned out to be a red herring, with a large police presence arriving to discover everyone had gone to Dundee instead. In Brighton the Computer Says No play was performed outside Atos offices to an enthusiastic crowd and heavy police presence. Liverpool and Leeds both saw demonstrations outside Atos, organised by local Solidarity Federation branches and the Black Triangle Anti Defamation Campaign. The Armchair Army, Virtual Resistance and Troll A Tory ensured that those unable to attend protests in person could make their feelings heard. Hundreds of online activists wrote to MPs, media outlets or trolled Tory websites throughout the day. Anti-benefit cuts camapaigners are now calling for escalation. A week of action against Atos Origin has been called beginning on May 9th. Please put this date in your diary.